In our How To Play Sic Bo article earlier this week, we took a look at how a complete round of this popular dice-based casino game is played. Now that you know the basics of playing, lets take a look at all of the different Sic Bo bets you can make. In these squares you can make a bet on single rolls of the dice. Placing a bet on one of these is a bet that at least one of the dice will fall on the number you bet on. For example, if you place a bet on the far left “One” square, you are wagering that at least one of the 3 dice will land on 1 when they are rolled. If one die lands on the number you wagered on, you will win at 1:1 odds. If 2 of the dice land on the number you wagered on, you will win at 2:1 odds. And if all 3 of the dice land on a number you bet on, you will receive 3:1 odds on your wager. As you may have guessed, the 2 dice bet is a wager on 2 dice at once. It is a wager that 2 out of the 3 dice will land on certain numbers. For example, if you bet on 3 & 4, you are wagering that one out of the three dice will land on 3 and one out of the three dice will land on 4. Winning bets in the Two Dice row of bets will pay the player 5:1 odds. If you are able to correctly bet on the total of the three dice, you can win up to 60 times your original bet in the Silver Oak Casino Version of the game. The Small and Big Bets are very popular due to their good odds, easy to understand rules, and amount of action they get (betting on one of these will win almost half of the time). The Doubles bet is a wager that two of the dice will land on the same number. The Triples bet is a wager that all three of the dice will land on the exact same number. Each of these wagers are on a specific number coming up as doubles or triples. In other words, a bet on “Double Three” is a wager that two of the dice will land on 3, a bet on “Triple Four” is a wager that all three dice will land on 4, etc. Finally, a bet on “Any Triple” is a wager that all of the dice will land on the same number, like the “Triples” bet above. However, instead of picking a single number that all of the dice will land on, a bet on “Any Triple” will win if all of the dice land on the same number, no matter what it is. In other words, a bet on “Any Triple” will win if the dice land on three 1’s, three 2’s, three 3’s, etc. 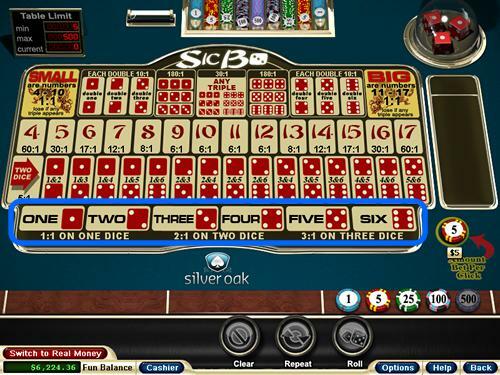 Now that you know how to play Sic Bo and what all of the bets are, download a free Sic Bo game from Silver Oak Casino and start playing! Also, be sure to check back soon as I will be posting an article all about the odds of the different bets and the perfect strategy to dominate the Sic Bo table.